God, I love that photo. It just conveys so much, right? Anger? Check. Frustration? Naturally. Bitterness? Most definitely. But neediness? Is Kristen Stewart needy? I never saw her as the type but apparently Robert Pattinson cut the cord because he couldn’t take her increasing clingy-ness. According to Hollywood Life sources the actor was fed up with Kristen’s dependence on him and grew tired of her need to be all hipstery in L.A. He’s a serious actor and everything now so he had no time for those shenanigans. Interestingly enough, Lainey Gossip’s sources said something similar. Basically Kristen has been working steadily since she was a kid and lately has been taking time to relax and enjoy her college years in L.A. Rob grew bored of her lack of ambition considering that was one of the things that always turned him on the most about her. So… she’s needy AND lazy? 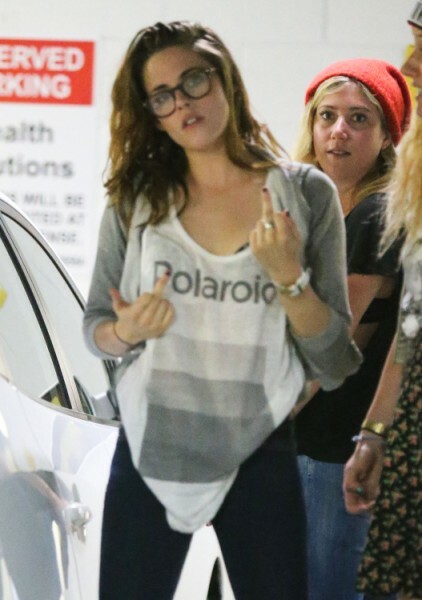 Again, never saw Kristen that way. So let’s compare, shall we? The Katy Perry/Robert Pattinson saga is all the rage after the “friends” spent time together this weekend at a wedding. Is Katy less needy? Does Katy have more drive? She seems to be a worker. And her rise to fame was anything but meteoric. She heard a lot of ‘no’s’ before she got her big break. Anybody can admit that’s admirable. And she was married to Russell Brand which makes her cool by association. But then she divorced him and seriously dated John Mayer which makes her lame by association. It’s a tough call. I’ve said it before though. Katy does seem less high maintenance and, quite simply, more fun. Is Rob just looking for a good time and a break from the black-framed hipster glasses?